Top secret project #1 is revealed! I am super excited to be part of this fantastic anthology. 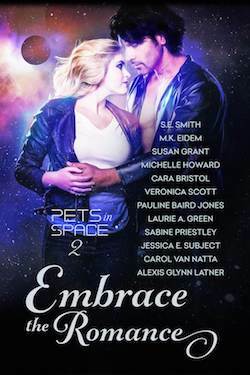 On October 10, 2107, me and 11 of my SFR author besties are releasing Embrace the Romance: Pets in Space 2 Anthology. You’ll get a dozen original never released stories that will take you to new worlds! I am also stoked to let you know that when you purchase Embrace the Romance: Pets in Space 2 Anthology you will be helping out Hero-Dogs.org, a charity that supports our veterans! 10% of the first month’s profits go to Hero-Dogs.org. Hero Dogs raises and trains service dogs and places them free of charge with US Veterans to improve quality of life and restore independence. How utterly cool is that? To find out more about my story, Sensate go to my Embrace the Romance: Pets in Space 2 Anthology page. Also, sign up for the Pets in Space newsletter. Everyone who signs up for the newsletter will receive an Embrace the Romance: Pets in Space 2 animated desktop wallpaper! You can also keep up with all of the Pets in Space news by following the Pets in Space Facebook group. Finally, stay tuned for a post about the Sensate characters Marco Dar (remember him? ), Zara Mancini and Ru.